The SunTrust Business Credit Card currently has an Informr score of 5.6 out of 10. This score is based on our evaluation of 2 sources including reviews from users and the web's most trusted critics. 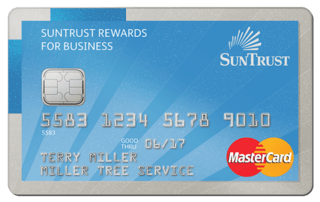 SunTrust Business Credit Card is typically available to those with excellent credit scores (650 or greater). This business card offers unbeatable flexibility with no preset credit limit and solid, business-friendly cash rewards. If you’re looking for a simple, no-annual-fee card for your business, the SunTrust MasterCard Business Credit Card could be a good choice. You’ll earn high cash back on gas and office supplies, with an intro APR period on purchases. Includes purchases made on office supplies. Intro rate applies on the first 12 months of account opening. Get a cash back bonus of 10% or 25% based on your Business deposit relationship with SunTrust when you redeem your Cash Back Rewards directly into a SunTrust Business Checking, Savings or Money Market account.